We never get tired of hearing about T-Mobile’s network getting bigger and better. 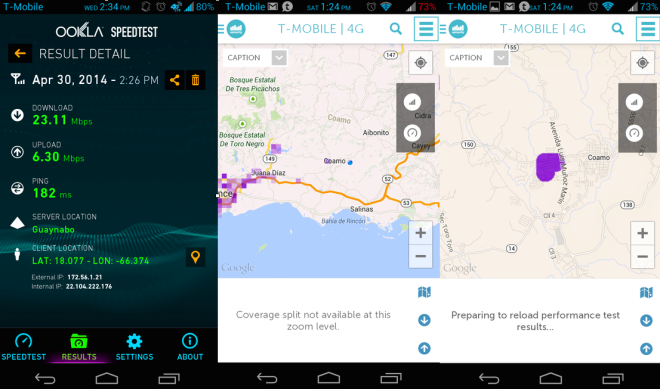 Today one of our readers got in touch to let us know that 4G LTE has just gone live in Coamo, Puerto Rico. Submitting a speed test yielded results of around 23Mbps down and 6Mbps up. Not quite the speeds of Dallas, but, you still can’t beat the feeling of upgrading from 3G/HSPA to LTE. As always, we love hearing from you if you notice any major speed improvements or new LTE networks going live. If you want to share your news with us, simply send me an email to cam@tmonews.com. What app is showing the coverage map? It’s not a feature of Ookla Speedtest. Lol no.. The pictures above are of the app sensorly. How the hell is someone going to say what it is if they have no idea and have never used RootMetrics or Sensorly? a damn shame! The 2 Maps are Sensorly and the Speed image is SpeedTest. lmao! Yay finally hopefully they speed it up in PR I dont want to go to claro or at&t they so Caras y rateras , but then again claro and att have the whole isla including vieques isla covered with 3G and half the isla with Lte. I still see 2G edge in many places like in caguas,bayamon, Carolina on tmobile while friends in claro and att have 3G or lte..
Where hoy are saying there is EDGE in Bayamon? Bayamon is covered with LTE and HSPA+ all over the place. Mi casa jaja my house in bayamon I only get 1 little bar Lte and hspa it usually drops down to 3 bars edge, usually all over bayamon I have solid Lte only my area were I live is bad ,but like I said I hope they expand cuz I have family living in other parts of PR and its not fun that when I go visit them I usually have edge while they have 5 bars lte on there claro and at&t phones. This is because PR has many cement buildings making it more difficult for signals to travel through these types of buildings. Outside where I live in Carolina, I have full bars LTE, but inside no service. It may not be the most widespread network around but tmobile is doing good where it needs to. I still see a lot of improvement on driving down highways. With sprint I never had any data loss as bad as tmobile. But after I reach my destination tmobile shines bright. Just this past weekend in orlando I got 62mbps on my nexus 5 while at disney hollywood studios. Its good to see them continue to expand. I can’t wait for all the 2g to be LTE by next year. That’s right! Puerto Rico as 4G LTE already in a lot of locations in the island. Puerto Rico is an important market for T-Mobile USA. The uncarrier movement here was one of the best success T-Mobile as had. Love this ! Considering i visit my family almost every year i would love if they continued the rollout all throughout the island. They would get alot more subscribers with the great priced plans.